April 5, 2014 Jessica threw 47'4" in discus and threw 21'4" in shot finishing 6th. Jessica threw at the MSAA North Central Regions. Jessica threw 48'2" in discus and 18'8.5" in shot put. 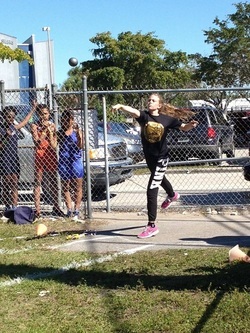 March 29, 2014 Jessica did long jump shot put and discus at the Pompano Express track meet. Jessica threw a personal best of 25'0" in shot put finishing 4 and finished 2nd in discus. March 8, 2014 Jessica competed in the PAL of North Miami meet she finished 4th in shot put with a throw of 19'. She also attemped long jump for the first time.